(One) Golden Eagle Thread Clipper 4 1/4"
Metal Clipper and handle. Self-opening spring action. Color and design may vary. 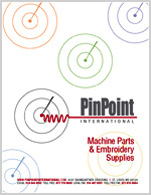 A versatile metal clipper for all embroidery operations, home sewing, garment industry and general utility. Mundial Soft Cushion Grip Shears 8"